Click on the links below for more information on these grid interactive power inverters. There are many different solar grid-tie inverters on the market today; all with different features, power ranges, options and prices. 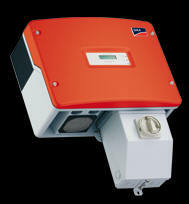 The most popular units that we sell are from SMA, Fronius, PV Powered & Sharp. We also offer Enphase, Outback Power's GT line, and Solectria, information regarding these invertors is coming soon. Regardless of which of these inverters you use, multiple inverters can be setup for use with a large solar array and wired to your existing AC breaker box. If you are planning to install a grid-tie PV system, the solar array and inverter need to be carefully matched to ensure that the inverter’s voltage and power limits are not exceeded. Please look over the grid-tie inverters below and then give us a call so we can discuss the details of your system. We will make sure that your proposed solar array will fit on the space available, that the physical layout of components is optimized to facilitate easier installation, that the system will produce the amount of energy you are expecting and that you get all of the incentives, rebates and/or tax credits available in your state. The Sunny Boy line of grid-tie inverters from SMA in Germany are the most popular units in Europe and have cornered a large portion of the US grid-tie market. With over 250,000 units installed worldwide, SMA has the experience and know how to create rock solid, super efficient grid-tie inverters. In the US market they offer units ranging in powe r output from 3000-7000 watts and these units are modular so you can have multiple units operating in parallel for large solar arrays. SMA inverters are available in sizes from 3000 to 7000 watts, making them ideal for a wide range of applications from small residential to very large 3 phase industrial systems. All SMA inverters come standard with built in LCD digital monitors that display instantaneous power output, energy delivered during the current day, and the total energy produced since installation. The SB3000 and SB4000 are auto sensing for 208 or 240 Vac applications. The SB 5000, 6000, and 7000 can be field configured for use in 208, 240 and 277 Vac applications. The SB 3000 through 7000 come with a DC disconnect switch with an integrated 4 input fused series string combiner. The DC disconnect connects to the bottom of the inverter for easy installation of service. The SB 3000 through 7000 are field configurable for positive ground arrays. Indoor/ outdoor NEMA 3R Enclosure, powder-coated aluminum (convection with regulated fan cooling). All sensitive electronic components are in a sealed compartment to ensure long life in harsh environments. Ambient temperature range: -13°F- +114°F. All models have a 10-year standard warranty and are certified to the new UL-1741/IEEE 1547 standards. For other Sunny products, check out their web site: www.SMA-AMERICA.com.